The covert and overt interventions taking place against Venezuela by the United States and its allies are a form of aggression and a violation of the fundamental principles of the United Nations Charter making the nations involved international outlaws. The attempted coup against President Maduro of Venezuela may have failed so far but the jackals that instigated it have not given up their objective of forcing the majority of Venezuelans benefiting from the Bolivarian revolution begun by President Chavez, back to the misery the revolution is trying to save them from. The United States and its allied governments and media, working with American military and civilian intelligence services, are pumping out a constant flow of propaganda about the start of affairs in Venezuela to mislead and manipulate their own peoples so that they support their aggression and to undermine Venezuelans support for their revolution. We have seen this type of propaganda before, the fake stories about “human rights” abuses, economic conditions, the cries of “democracy,” the propaganda about an “authoritarian” leader, a “tyrant,” “dictator”, all labels they have used before against leaders of nations that they have later murdered; President Arbenz, Allende, Torrijos, Habyarimana, Milosevic, Hussein, Ghaddafi are examples that come quickly to mind, so that the same threats against Maduro are not just propaganda but direct physical threats. We see the same smug lies and hypocrisy about the rule of law as they openly brag about their violation of international law with every step they take and talk as if they are gods ruling the world. The United States is the principal actor in all this but it has beside it among other flunkey nations, perhaps the worst of them all, Canada, which has been an enthusiastic partner in crime of the United States since the end of the Second World War. We cannot forget its role in the aggression against North Korea, the Soviet Union, China, its secret role in the American aggression against Vietnam, against Iraq, Rwanda, Yugoslavia, Afghanistan, Syria, Ukraine, Haiti, Iran, and the past several years Venezuela. Canada will take the lead in the aggression against Venezuela on Monday February 4th when it hosts a meeting in Ottawa of a group of international war crime conspirators, known as The Lima Group, a group of Latin American and Caribbean lackeys of the United States, including Mexico and Canada which was set up by the United States at a meeting in Lima, Peru on August 8, 2017 with the express purpose of overthrowing President Maduro. “In Canada’s global backyard?” It’s astonishing to read it. Canada regards the globe as its backyard? She manages to reveal a severe case of megalomania and insult the rest of the nations of the world at the same time. Her statement that Venezuela “is our neighbourhood” is almost a direct adoption of the American claim to hegemony and “interventionism” in the western hemisphere as if Canada completely identifies itself with the United States, that is, in terms of foreign policy, has completely merged with the United States. But, by doing so, the Canadian elite show themselves to be the enemies of progress and economic and social justice; shows them to be the antihuman reactionaries that they are. They also make themselves world outlaws. 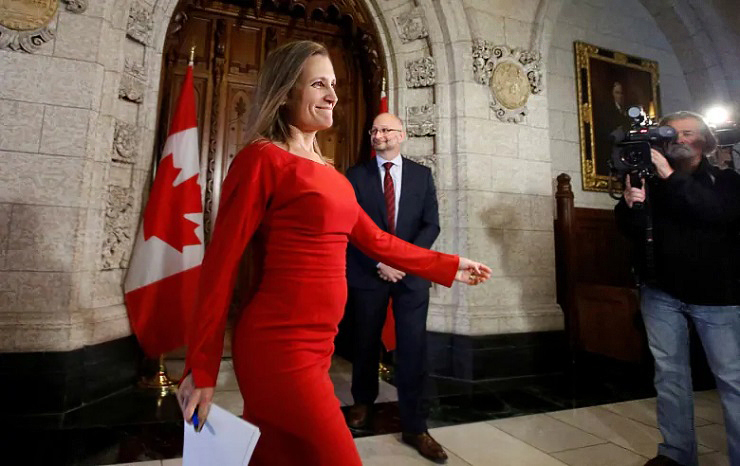 Freeland claims that the Lima Group meeting will“address the political and economic crisis in Venezuela,” yet it is Canada that, along with the United States that has created the very crisis they are using as a pretext to attack President Maduro. It is they that have tried to topple both him and Chavez through assassination plots, threatened military invasion and economic warfare that has the sole purpose of disrupting the social and economic life of Venezuela, of making life as miserable as possible in order to foment unrest while conspiring with internal reactionary forces. The Lima Group, began its dirty work in 2017 by issuing statements condemning the Bolivarian revolution, claimed that there was a break down of law and order in Venezuela and attempted to cancel the elections just held which gave President Maduro a solid majority of 68% of the votes in what all international elections observers judged free and fair. Following the election of Maduro all of these nations withdrew their ambassadors from Venezuela. They did all this while claiming that their actions were taken “with full respect for the norms of international law and the principle of nonintervention” when they are plainly violating all norms of international law and the principle of non-intervention. They are also violating the UN Charter that prohibits any nation or group of nations from taken action outside the framework of the UN Security Council against any other nation. The Ottawa meeting is in fact a meeting of criminal conspirators that are intent on committing acts of aggression, the supreme war crime against a sovereign nation and people.Intervention is generally prohibited under international law because it violates the concept of independent state sovereignty. All nations have the right to govern themselves as they deem fit and that no nation could rightfully interfere in the government of another.Since there can be no intervention without the presence of force or threats of its use the actions taken and threats made against Venezuela constitute the crime of aggression under international law. solidified three years later at Buenos Aires with the adoption of the Additional Protocol Relative to Non-Intervention. This document declared “inadmissible the intervention of any of the parties to the treaty, directly or indirectly, and for whatever reason, in the internal or external affairs of any other of the Parties.” The U.S. government agreed to this treaty without reservation as well. The United Nations has become the primary source of the rules of International behavior since World War II. The principle of nonintervention between states is everywhere implicit in the Charter of the United Nations. Article 1 of the U.N. Charter sets out the four purposes of the organization, one of which is “to maintain international peace and security,” a task which includes the suppression of “threats to the peace,” “acts of aggression” and “other breaches of the peace.” Another is “to develop friendly relations among nations based on respect for the principle of equal rights and self-determination of people.” Article 2(1) goes on to base the organization on “the principle of the sovereign equality of all its members.”Articles 2(3) and 2(4) require Member States to utilize peaceful means in the settlement of disputes and to refrain from the use of force. Thus, Article 2(4) prohibits the use of the economic and political pressures and the indirect subversion which is an integral part of covert action. by the numerous resolutions passed by the General Assembly which assert the right to national sovereignty and the principle of nonintervention in general, while specifically condemning particular tactics used in covert action. By Resolution 2625 (XXV), the General Assembly adopted the “Declaration on Principles of International Law concerning Friendly Relations and Co-operation among States in Accordance with the Charter of the United Nations.” The Declaration had its origins with the first meeting of the Special Committee on the Principles of International Law held in 1964 in Mexico City. This document asserted seven basic principles of international law, then elaborated how these principles were to be realized. The seven principles embodied in the Declaration were: a) the principle prohibiting the threat or use of force in international relations;b) the principle requiring the peaceful settlement of disputes; c)the duty of nonintervention; d) the duty of states to cooperate with each other; e) the principle of equal rights and self-determination of all people;f) the principle of sovereign equality of states; and g) the good faith duty of states to fulfill their obligations under the Charter. I can go on listing other UN resolutions stating the same. Again and again the General Assembly hammered home the importance of the principle of nonintervention as a central maxim of international law. So, there you have it; the law. The world can see that the Lima Gang, who like to use the phrase “the rule of law” in their diktats to others, are committing egregious crimes under international law and together these crimes are components of the supreme war crime of aggression. The Lima Group therefore is a group of international criminal conspirators and the every individual involved is a war criminal. So when the Lima conspirators issue their press statement after the Ottawa meeting, planning aggression against Venezuela, calling for the overthrow, for the head of President Maduro and dressing it up in the usual language of the aggressor, of “human rights” and “democracy” and their fake and illegal doctrine of “responsibility to protect” it will not be issued by nations interested in peace or who have respect for international law but by a gang of criminals, of international outlaws.